If you are a BIG fan of the family gameshow Deal or No Deal plus you love to play online slots then you should definitely check out Deal or No Deal Spins. This new online slots website takes the television game show theme and mixes it with the fun of playing your favourite slot games and casino style games too. You will find promotions including ‘The Bankers Call’ and ‘The Bankers Cash Machine’ to help keep the excitement going just like the television show. 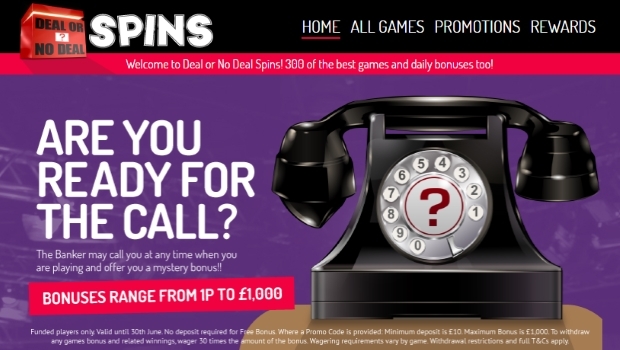 Joining Deal or No Deal Spins is extremely easy and if you use the links or buttons in this article you can claim an ‘exclusive’ offer that is worth 4 times as much as the standard welcome bonus offer. By using our links you will be taken to a unique registration page which will only take a few minutes to complete. Once the form is complete you can make your first cash deposit and instead of the normal £25 and 25 free spins you will get up to £100 in free games bonus and 100 free spins. Just make sure that you enter the code ‘DEAL100’ when funding your account. 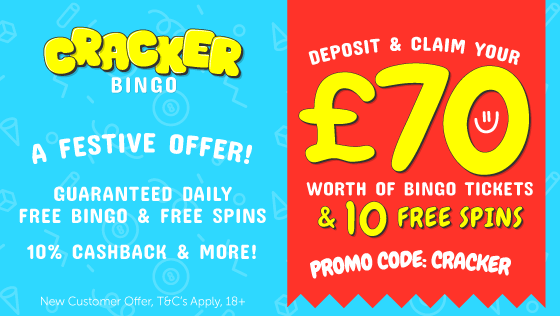 This is a great way to enhance your play at Deal or No Deal Spins and see your money go even further. As with all welcome bonus awards, there are terms and conditions and wagering requirements. This particular online games website has lots to offer with over 200 games to choose from. If you enjoy playing casino-style games then even these are available. You can play classic casino games such as Blackjack, Baccarat, Oasis Poker and Texas Hold’em. However, it is the video slots that offer the widest choice and variety. You are bound to find a game that you enjoy as they have well-known titles, new titles and classics. Some of the titles you can choose to play include Starburst, Guns ‘n’ Roses, Fluffy Favourites and Gonzo’s Quest. You will also find progressive jackpots such as Millionaire Genie where you literally can become a millionaire in an instant. 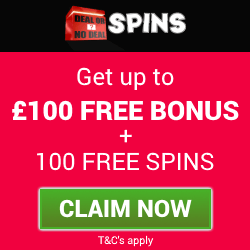 So why not give Deal or No Deal Spins a try today and claim your exclusive bonus of up to £100 and 100 free spins? For full terms, conditions and wagering requirements of this exclusive bonus offer, please visit the Deal or No Deal Spins website.